Our range Porcelain Parts Ceramic Parts included Lamp holders, HRC Fuses , LT / HT insulators , Band Heaters parts, Capacitors Bushes, Capacitors Bushings, Thermostat parts etc. Steatite Is used primarily in the electronic and appliance industries. Steatite has high dielectric strength over a wide temperature range with moisture absorption of less than 1%. 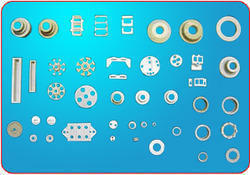 Common applications are: Heating Element Holders, Stand-Off Insulators, Washers, and Bushings. 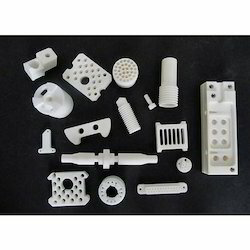 In order to meet excellent quality standards, we are supplying Ceramic Steatite Parts. We are engaged in offering Ceramic Steatite Parts.